Is there anything better than coming home to a hot meal, ready and waiting for you? My husband gets to enjoy that quite often. I, however, have to think ahead if I want to experience that luxury (love you anyway Mikey!). 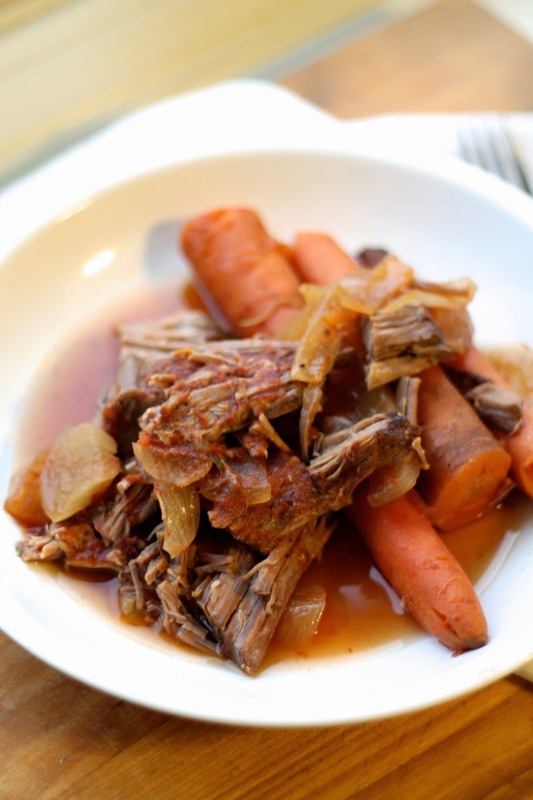 As such, I've been experimenting a lot with my slow cooker lately, and this pot roast recipe will be on repeat for us this winter. Pot roast is the perfect cut of meat for the slow cooker because it's a larger size and doesn't dry out even when it's cooked all day. I love a classic pot roast cooked in beef broth, but this tangy version, with a sweet and savory sauce of crushed tomatoes and apple cider vinegar, is the perfect twist. Heat a saute pan to medium high heat. While the pan is heating, pat the meat dry and season it generously with salt and pepper. Add butter and olive oil to the pan and swirl to coat. Add the meat to the pan and brown it on all sides (about 1 minute per side). In the slow cooker, layer celery and carrots on the bottom of the pan. Place the beef on top, then scatter onions through out. In a bowl, whisk together crushed tomatoes, beef broth, cider vinegar and brown sugar. Pour this mixture in the crock pot. Add garlic cloves, bay leaf, and thyme to the pot. Cook on low for 8 hours, or until the meat is fork tender. Enjoy!